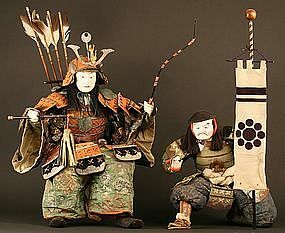 Extremely Rare 18th Century Japanese Musha Ningyô (Boys Day) Dolls, Samurai Set. Ningyô this early almost never appear for sale, much less with all of its original accessories, as we have here with this very fine, scarce, museum quality pair. We are very proud to offer this set. They have finely carved faces, and are lacquered with many coats of Gofun (Oyster Shell). 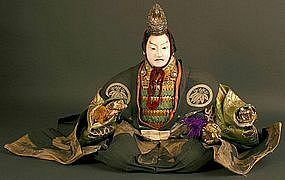 They are adorned with sumptuous silk brocades and silk armor, indicative of mid Edo Period Ningyô artists. This set is a treasure of great importance for the most discriminating collector. 24 inches (61cm). From a widely renowned and published collection that has been exhibited at the Metropolitan Museum and Japan Society. 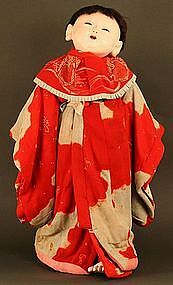 Rare Large Edo Period (circa 1830-1860) Japanese Gosho Ningyo Depicting a Sumo Wrestler, clothed in exceptional finely embroidered textile with a floral design and Shishi (guardian of Buddha) on chirimen silk crepe. This large scale, wood-carved Ningyô has a beautifully rendered expressive face lacquered with Gofun (Oyster Shell). The pose is most striking, as well. Really an extraordinary find for the Ningyô enthusiast. 18 inches, 46 cm. From a widely renowned and published collection that has been exhibited at the Metropolitan Museum and Japan Society. 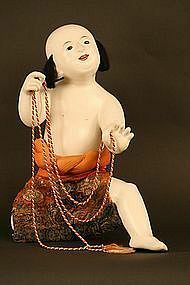 Edo Period (circa 1820) Japanese Daki Ningyô (Hugging Doll) standing at the unusual height of 27.5 inches (70 cm), making him a very rare and striking figure. It is most uncommon to see this type of Ningyô outside of Japan, for they are highly prized by the Japanese. 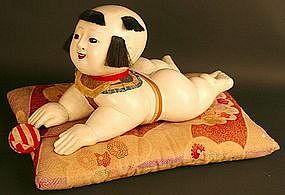 A widely held theory has it that these dolls were commissioned by patrons of Geisha as presentation gifts. This one is outstanding in every way. It has a wonderfully expressive face and conveys a very happy spirit. He wears a spectacular kimono with many layers of beautiful textiles and chirimen silk done in shabori motif. From a widely renowned and published collection that has been exhibited at the Metropolitan Museum and Japan Society. Japanese Hai Hai Gosho Ningyô. 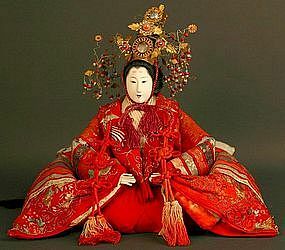 This extremely rare form of Japanese Doll is one of the most sought after of Gosho (Palace Doll). They were presented to royalty and upper class at the birth of a baby, and placed in the baby's chamber to protect from bad spirits. This is a very large example of this type of Gosho. It is covered with many layers of Gofun (Oyster Shell Lacquer) over papier mache. The hair is made entirely of silk. This most adorable baby is wearing a brocade bib and sits on a cushion while holding a Din Din (toy). Late 19th Century. 8.5 inches (21.5cm) high x 15.75 inches (40cm) long. From a widely renowned and published collection that has been exhibited at the Metropolitan Museum and Japan Society. 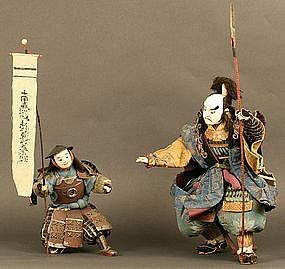 Extremely Rare 18th Century Edo Period (circa 1780) Musha Ningyô (Japanese Boys Day Figures) representing the famed brave warrior, Kato Kiyomasa (1562-1611), who accompanied Hideyoshi on his campaign against Korea. He is gloriously represented here, along with his attendant holding a banner of a Buddhist prayer, in this spectacular Ningyô. Kato is wearing sumptuous brocades, a black velvet trim robe with gold trim and is holding a spear with a sword at his side. He is seated on a military camp stool. Large Figure: 14 inches (35.5 cm); Small Figure: 9.5 inches (24 cm), Banner 18 inches (46 cm). From a widely renowned and published collection that has been exhibited at the Metropolitan Museum and Japan Society. 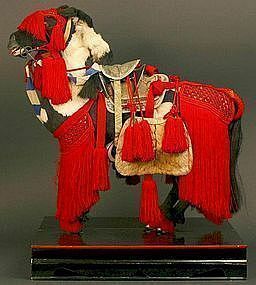 Late 19th Century Japanese Kazari-Uma (Battle Horse). This deluxe extraordinary example is attributed to Marurei, one of the most important Ningyô artists. He now has Japanese National Treasure status. This handsomely adorned military horse is displayed on a Boys Day stand. The body hair is done by a technique called Ke-Ue-Saiku "fine work of fur planting" in which silk hairs are pasted on. It has gorgeous silk and lacquer trappings. It is positioned on a fine lacquered stand. This wonderful piece is of the finest quality. 28 inches (71cm) tall x 6 inches (15.5cm) wide x 20 inches (51cm) long. From a widely renowned and published collection that has been exhibited at the Metropolitan Museum and Japan Society. 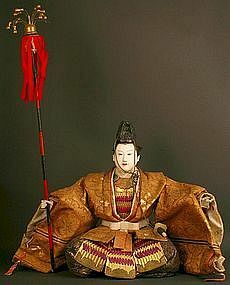 Meiji Period (circa 1880) Japanese Musha Ningyô (Boys Day Doll) depicting the Legendary Toyotomi Hideyoshi, seated in court position wearing dramatic brocades and gold lacquered armor, a gembun fan in his right hand and wearing a classic winged cap. His face is finely carved with a regal expression. This Ningyô is Meiji craftsmanship at its best. 14.5 inches, 37 cm. From a widely renowned and published collection that has been exhibited at the Metropolitan Museum and Japan Society. 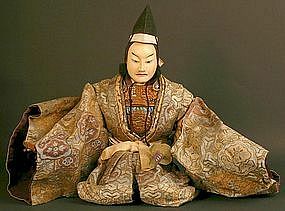 Early Meiji Period (circa 1870) Japanese Musha Ningyô (Boys Day Doll) of Emperor Ojin, Japan's first historically verified emperor. He has been deified as Hachiman Daimyojin, regarded as the guardian of warriors. This boys day figure is gorgeous in every way. The brocades are so sumptuous and the face is magnificent. He is wearing a Kabuto (court hat) and holding a long battle baton complete with a sword. The figure is 14 inches (35.5 cm) tall, and the overall height is 24.5 inches (62cm). From a widely renowned and published collection that has been exhibited at the Metropolitan Museum and Japan Society. 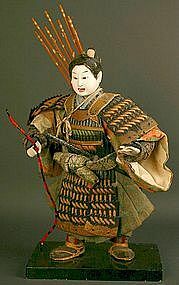 Edo Period (circa 1800) Japanese Musha Ningyô (Boys Day Doll) in court attire. This early example is wearing a court hat and court robes of sumptuous brocades. He is holding a fan and sword at his side. It is of very high quality and likely made for a Daimyo family. 11.5 inches, 29 cm tall. From a widely renowned and published collection that has been exhibited at the Metropolitan Museum and Japan Society. Very Old Edo Period (circa 1720) Extremely Rare Set of Three Female Musicians for Hina Matsuri (Girls Day Festival) Almost all musician dolls were male, making this group highly unusual, especially from the 18th century. They have the most wonderful features painted on carved wood covered with burnished gofun (oyster shell lacquer). The textiles are chirimen silk. 8.75 inches (22.5 cm) tall. From a widely renowned and published collection that has been exhibited at the Metropolitan Museum and Japan Society. 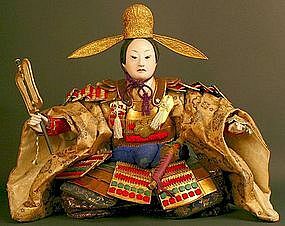 Late Edo Period (1850-1868) Japanese Musha Ningyô (Boys Day Doll) wearing an Eboshi, a court hat and robes with crests. He is seated in a court position and has a handsomely caved face. His silk fiber hairs are tied in a top knot. This is a well executed example. 11 inches (28cm) tall. From a widely renowned and published collection that has been exhibited at the Metropolitan Museum and Japan Society. Early Meiji Period (circa 1880) Japanese Isho Ningyô of Sugawara no Michizane dressed in court attire. After his death, he was deified as Tenjin, the God of Literature and Knowledge. He gives an impressive appearance, elegant and commanding. His face bears an imperial expression. 28 inches, 71 cm. From a widely renowned and published collection that has been exhibited at the Metropolitan Museum and Japan Society. Meiji Period (circa 1890) Japanese Hago-ita (Battledore or Badminton) Paddle in its original display case. It is very rare to find one from this time period, especially with its original case. A deluxe example that is enhanced with three dimensional objects. We have never seen such a wonderful and elaborate Hago-ita. 26 inches 66 cm) tall with case. From a widely renowned and published collection that has been exhibited at the Metropolitan Museum and Japan Society. Late 18th Century Gonin-Bayashi, Five Japanese Musicians displayed on a Hina stand. This set was made as an addition to those Ningyo already displayed on a tiered stand. They imitate a Noh orchestra. This set has very finely carved faces, covered with burnished Gofun. Because of their size and age, these are highly desired by collectors. Average height of figures is 4 inches (10 cm). 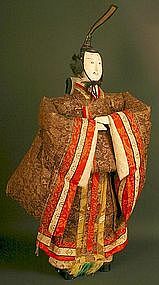 Fine Meiji Period (circa 1870) Bunraku Puppet of a Sambaso Dancer. This rare puppet is operated by three Puppet Masters, who make it come to life to present a magical theatrical experience. He is carved of wood and covered with Gofun. He wears a rich blue and red robe with white under robe, and his head is adorned with a gold and black velvet hat. An embroidery Crane graces his back. The bells on his feet sound when he dances. 35 inches (89cm) height.